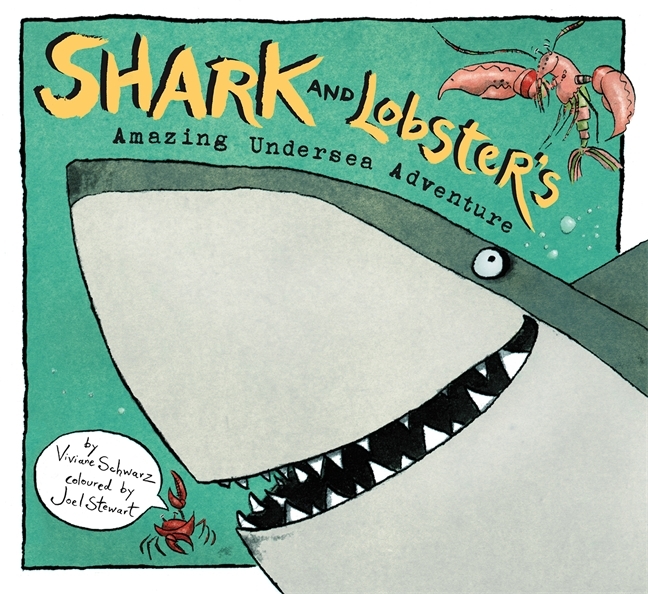 Shark and Lobster may seem tough and scary to you, but they have plenty to be scared about themselves. Like tigers! Did you know that they walk on their teeth and glow in the dark and will EAT YOU UP? But Shark and Lobster have some ideas about how to keep themselves safe from the scary, striped tigers. Ridiculous in all the best ways, this is the kind of book that’s really meant more for the younger elementary school crowd than pre-readers. There’s a lot going on each page, plenty to keep new and almost readers busy and thinking and laughing. “A day is a perfect piece of time,” just right for trying all kinds of new things. How much can you fit in a day’s worth of activities and daydreams? 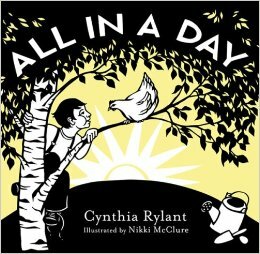 Rylant’s poetic musings and McClure’s bold and elegant illustrations are a perfect pair for this book about the pleasures of the outdoors. The only misstep is the alternating use of blue and gold in McClure’s illustrations; the limited use of colors throughout the book doesn’t seem to match the themes, and the alternating pattern doesn’t appear to have any relation to to the text. Stretch. Pounce. Clean. Scratch. Page by page, Big Cat shows Kitten all the most important things one needs to know about being a cat. 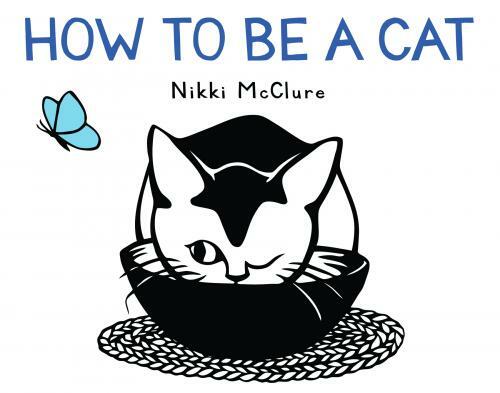 McClure’s bold and graphic style is put to perfect use in this picture book. Each page features a single word and an illustrated definition featuring the two cats. The use of black and white, with small punches of baby blue for letters and scattered butterflies, gives it a calm but memorable style. While the mixture of quiet (listen, wait) and loud (explore, chase) actions create a rhythm that soothes and entertains. Sunny has decided that his home in the Kalahari Desert, with all his meerkat family, is just a little too hot and too crowded. So he packs his bags and sets off to visit relatives. 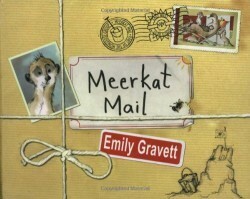 Page by page, Gravett and Sunny cleverly show readers how and where various species of mongoose live around the world. A great and entertaining book for inquisitive elementary age children. 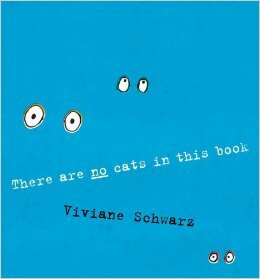 A warning to cat lovers: there are absolutely NO cats in this picture book. At least, there wasn’t supposed to be. But we seem to have stumbled across a trio of felines before they had a chance to head out and see the world. Their suitcase is packed and they’re all ready to go – just as soon as they can figure out how to get out of the book. Will they ever make it? With a little help from readers like us, they just might. Be careful though, you never know what they may bring back from their travels. The tale Schwartz tells is simple but clever, and the various folds and pop-outs help give this book a little something extra without overwhelming the story itself. The illustrations are bright, bold, and minimalist, yet sketch-like rather than precise, matching both the story’s playfulness and the characters’ personalities. Creepy crawlers, sharp knives, and LOUD NOISES! 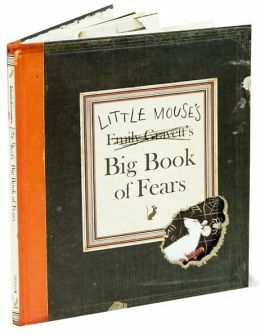 – these are all things that Little Mouse is afraid of. What are you afraid of? Although the regular text is sparse, there is so much going on in this book. Flaps, textures, cut outs, newspaper clippings, and much more. But don’t mistake it for a book for very young children, the jokes are layered and involve really big words like “aichmophobia” and “rupophobia.” Older children (and a few fearless younger ones) will love exploring each page and testing out the long and official sounding words that grace the illustrations. The conclusion of Elliot’s Spiritwalker trilogy. In which there are more “Revolutions to plot. Enemies to crush. 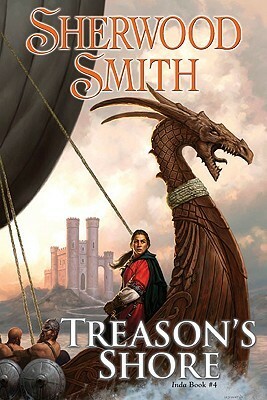 Handsome men to rescue.” I’d tell you more, except that I would have to include spoilers for the first two books. There are so many things that I love about this series, but Cat and Bee’s relationship is definitely my favorite. Closely followed by Cat’s refusal to just sit and let Vai take care of everything, no matter how much she loves him. Also, all of the details about food and clothes and language and customs that make this alternate Earth so real and tangible. I never know what to say about the plot of Code Name Verity because I’m always afraid I’ll reveal too much or color people’s perceptions more then I ought to. So instead I’ll just say that it’s a book about friendship. And war. About courage and loyalty and so much more. 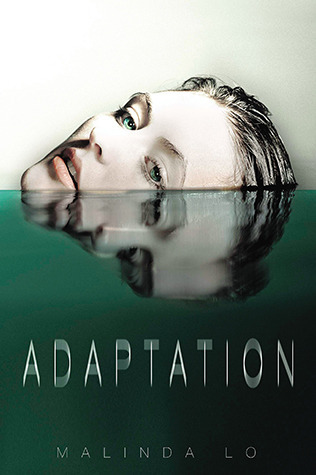 It’s one of the best books that I’ve read and I want everyone ever to read it too and tell me what they think. So much so that I gave three different people their own copies this Christmas. When solid, dependable Auden decides to spend the summer at the beach with her dad, stepmom, and new half sister, no one is more surprised than Auden herself. She’s not sure she made the right choice, what with Thisbe crying at all hours and Heidi and her father fighting, but neither does she feel up to going back home for the summer and watching her mother flirt with – and then discard – yet another graduate student. So when Heidi asks Auden if she might be willing to do the accounting for her boutique while she’s out on maternity leave, Auden jumps at the excuse to spend a few hours away from the house and alone in the quiet office in the back of the store instead. Auden doesn’t plan on making friends with the girls who work there, or on spending her summer collecting the childhood experiences she never got – like learning to ride a bike. But since when does life go according to plan? Reviews of Dessen’s work (mine included) tend to make it sound like if you’ve read one Dessen novel, you’ve read them all. 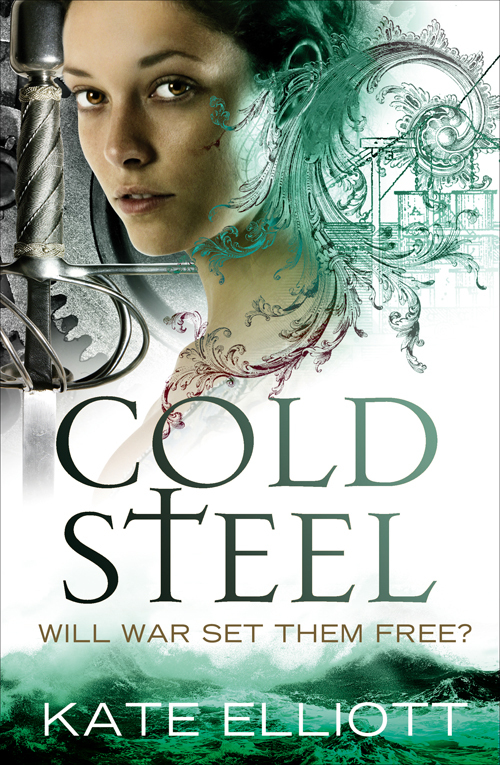 While there’s certainly some truth to that, I have to say that I like her more recent work much better than her earlier novels. She may be telling variations on the same story over and over, but it’s a good story, and her writing has definitely improved with practice. Along for the Ride has just the right mix of friendship, romance, and family; the characters are still unique and a little bit odd at times, but they feel more like actual humans and less like people playing parts; and while the ending is predictable, Auden’s path to that point is less so. All of which makes Along for the Ride a fun, light, sweet novel.